Bathed in natural light with expansive views, Chill Hill is a private hilltop getaway that's perfect for a memorable, relaxing wine country holiday. Set on nearly an acre of lush grounds, it's an immaculately kept, designer home that's perfect for indoor and outdoor living. The home features lush, natural vistas from every window (even the bathrooms) and is located within minutes of world-class vineyards, wineries, and the Pacific coast. Centered between the quaint towns of Healdsburg, Sonoma, Glen Ellen, Kenwood, and Sebastopol, it's a perfect location -- close to everything, but feels like a million miles away. Inside: The house has three bedrooms . - First floor large master with en suite bath and natural stone, walk-in shower for two. - Second floor: 2 bedrooms that share a brand new, slate and marble bath and open to an adjoining sunroom/sitting area. - Main floor: living room and dining area with formal seating for six and picture windows facing the Russian River Valley, Dry Creek Valleys and the coastal hills. - Large, open, chef's kitchen with Viking appliances, commercial gas range, La Pavoni espresso machine, and an 11-foot antique work table from 19th century France with stool seating for casual meals. - - Seating area with wood-burning fireplace, flat screen TV, and a giant picture window with expansive valley views all the way to the coast mountains. Gorgeous sunsets are guaranteed just about every evening. - For the musically inclined, there's a Yamaha C7 concert grand piano in the living room. - Natural wood plank floors span the first floor with Persian carpets, recessed halogen lighting (all on dimmers), Asian antiques, and original artwork. The house is instantly comfortable and decorated with restraint and casual elegance. A short walk down the hill will take you to the area's best boutique grocery, a coffee shop, florist, and a popular family restaurant -- all locally owned. The renowned Santa Rosa Certified Farmer's Market is a few miles away on Wednesday and Saturday mornings. Downtown is just a few minute's drive where you'll find Michelin-awarded restaurants, cafes, shopping, movies, live music, brew-pubs, attractions, and more. And of course, there are hundreds of world-class wineries to be explored in every direction. We've left an extensive list of our favorite local spots for guests. ***Please note that parties, events, weddings, annulments, festivals, Burning Man reunions, and related celebrations at the home are strictly prohibited. It's really quiet here and respect for neighbors and nature is essential. You'll find Chill Hill to be a super peaceful and restful escape of the best kind. Welcome to Sonoma County! Great memories last a lifetime. We hope that you experience the best of Sonoma County like we have, at Chill Hill. Panoramic views of the entire Russian River Valley, Dry Creek Valley, and the coastal mountains. Killer sunsets guaranteed. Houses in this area have no air conditioning. Nights are naturally cooled by ocean breezes and there lots of windows for cross ventilation. Heating is sparsely used in winter only. Front loading washer and detergent provided. Wood burning fireplace for winter evenings. Hi-Speed cable Wi-Fi included, serves the entire house and outdoor areas. Bath towels and pool towels are included. Well-stocked with many pantry items, spices, olive oils, etc. Stocked with utensils, dishes, glasses, pots, pans, etc. Stocked with most essential kitchen items. Indoor dining: kitchen and dining room seating. Outdoor dining: poolside, overlooks Russian River Valley view. High definition (HD) Comcast Xfiniti cable, all premium channels, HBO, Showtime, Cinemax, etc. included. On-demand movie rentals are available for an additional fee. i-Pod/phone/tablet or computer connections provided inside and out. Bring your music player. There's also a turntable and vinyl LPs in the master bedroom. Readers will find lots of choices -- the sunroom features a stocked bookcase. Bring your media device and plug-in to our sound systems in/out. Random selection of discs provided in the sunroom. Expansive (1 acre) outdoor space. Unfortunately, events, parties, gatherings, and weddings are *strictly prohibited* in this area and at this property. Multiple outdoor seating areas and nooks dot the property -- most with perched views of the Russian River and Dry Creek Valleys. Pool is serviced weekly on Thursdays and is best from April - October. It's totally private. Roll-out thermal cover keeps the temperature between 82-88 degrees in the summer. Hot tub is not included with rental. By request, custom filling and service is available with notice and additional fee. The view was perfect - we enjoyed watching hot air balloons in the morning over coffee from the comfort of the living room! House was just as described - comfortable, clean, and felt like home. The host was very communicative and accomodating. Would absolutely come back for another stay! Just had a wonderful stay in wine country, the home was perfect! Kitchen had everything we needed, there was even a BBQ on the patio. Quiet, yet close to town, with wonderful views of the valley and sunsets. Thank you for sharing your home with us. Quite and serene. Close to everything! Chill Hill was the perfect resting spot after a day enjoying all Sonoma County has to offer, wine tasting, redwoods, and whale watching. Thank you for taking such great care of everything! Glad you enjoyed your holiday Kris. Everything was perfect. Immediately felt right at home. Highly recommended! (insert thumbs up emoji here)! We loved the quiet surroundings and nature out every window. But the enormously calming view and proximity to everything will bring us back here. There were more great restaurants within a 10 minute drive than we have in our entire state back home. Sonoma County is absolutely beautiful and this is a great base for seeing it all! Super recommended. Much gratitude for the kind words and for taking such great care of the place during your stay! Hope to host you on your next trip to Wine Country. Tucked into the gentle, verdant Sonoma County foothills, Chill Hill is just a few minutes to the downtown: shops, restaurants, cafes, brew-pubs, local gourmet treats & attractions. 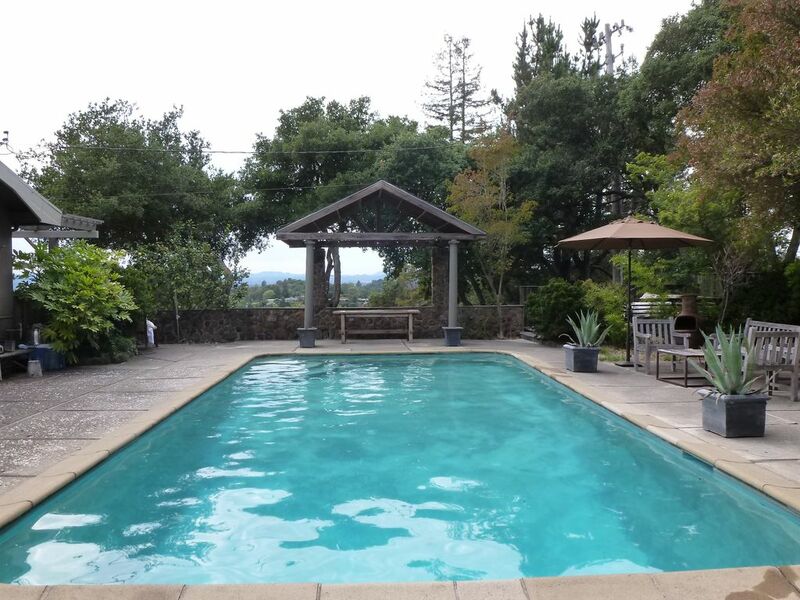 It's only 15-20 minutes to Healdsburg, Sonoma Square, Kenwood, Glen Ellen, Petaluma, and about 25 minutes to the legendary beaches and coves of the Pacific Coast. Located about 45 minutes north of San Francisco, you'll find over 200 wineries within a short drive. Napa Valley is to the east and world-class cycling roads (and trails) connect the entire area. While the home and grounds are private, quiet, and perched on a secluded ridge-top with amazing vistas, you can descend the hill in minutes to be in the heart of the action if you choose. 1) There is a 5-night minimum stay. 2) The standard cleaning cost is $135. For additional cleaning days during your visit, or should heavy cleaning be required, an additional fee is necessary.